Note:If the crankshaft bearings have been used in a running engine, you must replace themwith NEW crankshaft bearings for reassembly. 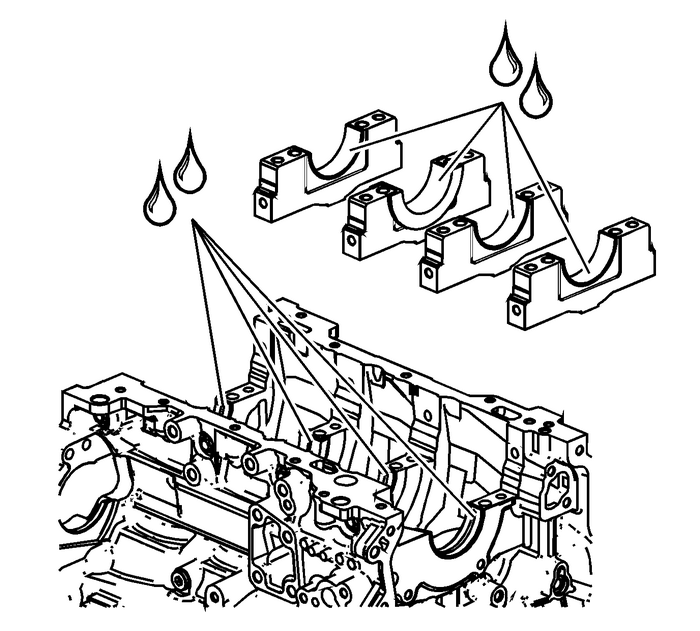 Clean the crankcase crank bore with a lint-free cloth.Clean all the oil from the backside of new bearing halves. Install the NEW upper crankshaft bearings into position. The thrust bearing belongsin the number-3 journal. 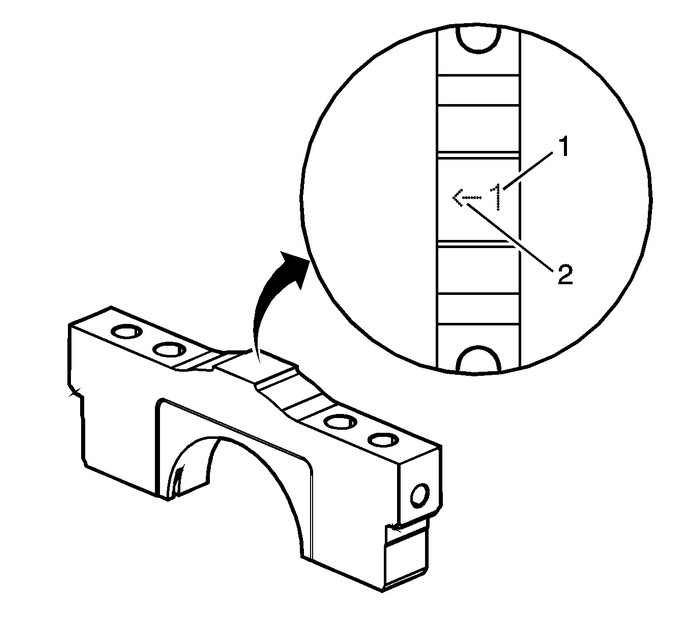 Ensure that the upper bearing insert contains the oil transferhole and groove. 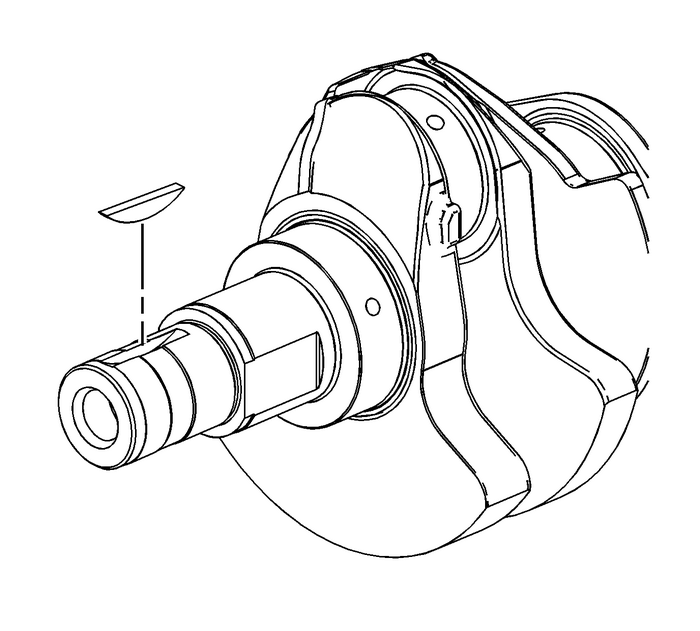 Roll the bearing into position so that the lock tang engages thecrank slot. 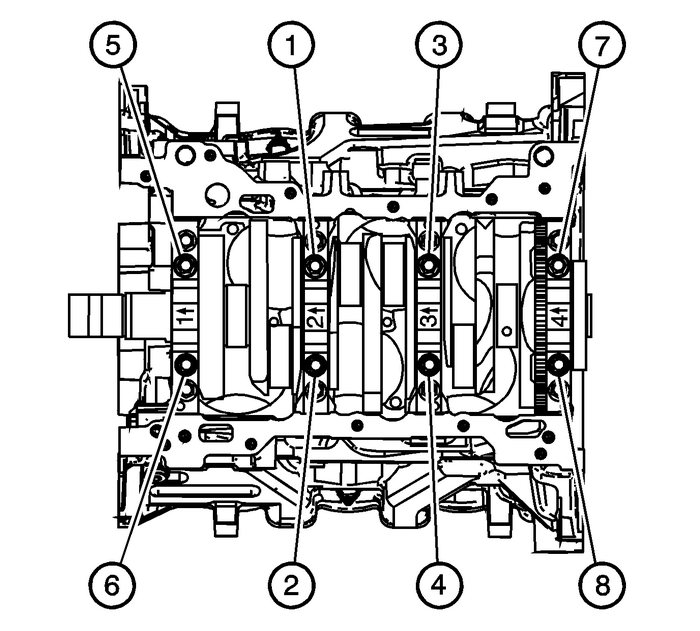 The bearing must fit flush with the upper crankcase. If removed, install the crankshaft key. Lightly tap the key in place with a smallsoft face, bronze/plastic, hammer until it bottoms in the keyway. 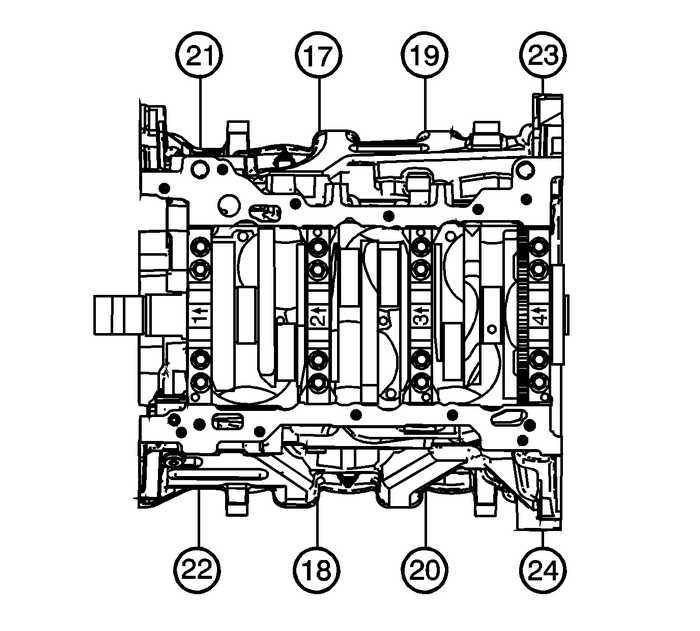 Place a length of fresh, room temperature plastic gaging material all the way acrossall the crankshaft bearing journals.Identify the proper order of the main bearing caps. The main bearing caps are numbered-1-(1)through-4, with the front main bearing cap marked with the number-1. The arrow-(2)is to be oriented to the front of the engine. Install the crankshaft main bearing caps.Loosely install the original inner main cap bolts.Loosely install the original outer main cap bolts. Loosely install the original short/inner side main cap bolts.Loosely install the original long/outer side main cap bolts. Tap the crankshaft main bearing caps with a soft-faced hammer. 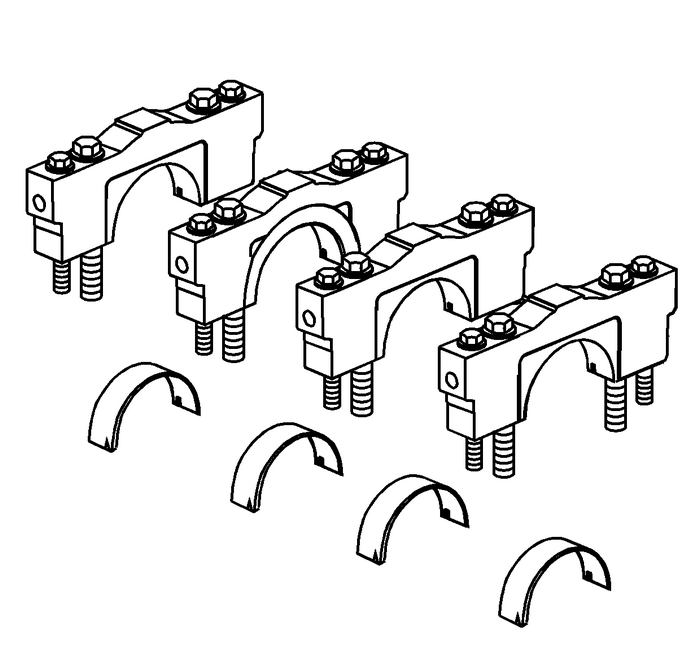 Tighten the inboard bolts-(1–8) first, in two passes.Tighten the inboard bolts to 20-Y (15-lb-ft) on the first pass.Tighten the inboard bolts-(1–8) an additional 80-degrees on the 2nd pass. Tighten the outboard bolts-(9–16) second, in two passes.Tighten the outboard bolts to 15-Y (11-lb-ft) on the first pass.Tighten the outboard bolts-(9–16) an additional 110-degrees on the 2nd pass. Tighten the short/inner bolts-(17–20) third, in two passes.Tighten the short/inner bolts to 30-Y (22-lb-ft) on the first pass.Tighten the short/inner bolts-(17–20) an additional 60-degrees on the 2nd pass.Tighten the long/outer bolts-(21–24) fourth, in two passes.Tighten the long/outer bolts to 30-Y (22-lb-ft) on the first pass.Tighten the long/outer bolts-(21–24) an additional 60-degrees on the 2nd pass. After reaching final torque, allow the assembly to sit for 2-minutes. 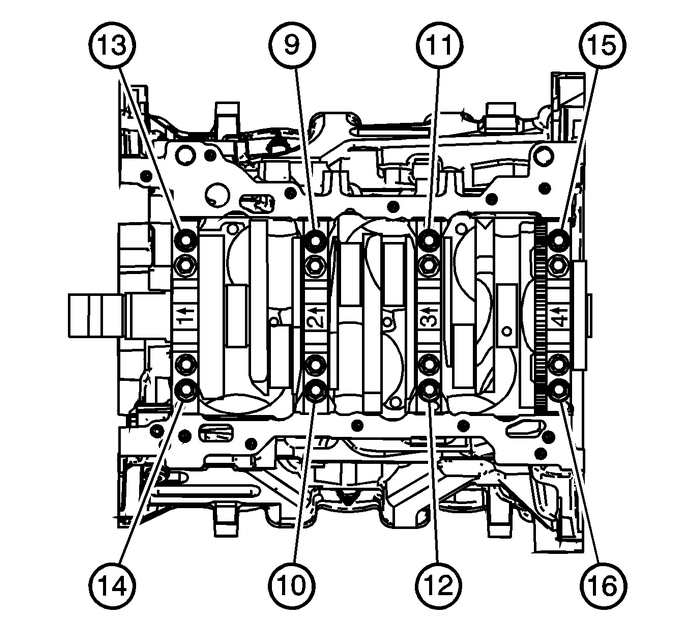 Remove the crankshaft bearing cap side bolts. Remove the crankshaft bearing cap outer bolts.Remove the crankshaft bearing cap inner bolts.Remove the crankshaft bearing caps using the GE 6125-1B adapterand EN 49102 remover. Determine the crankshaft bearing clearance by comparing the width of the flattenedplastic gaging material at its widest point with the graduation on the gaging materialcontainer. 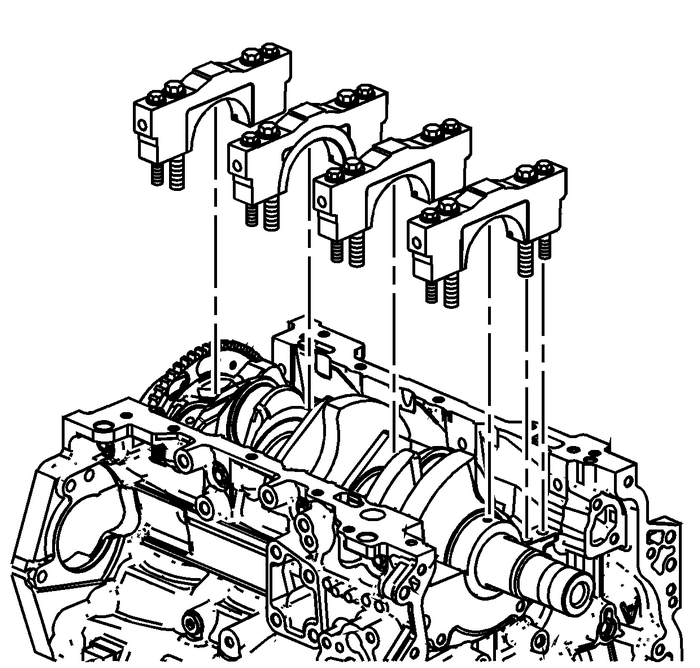 Note:The crankshaft bearings CAN be reused after checking the clearance if the bearingshave never been used in a running engine. 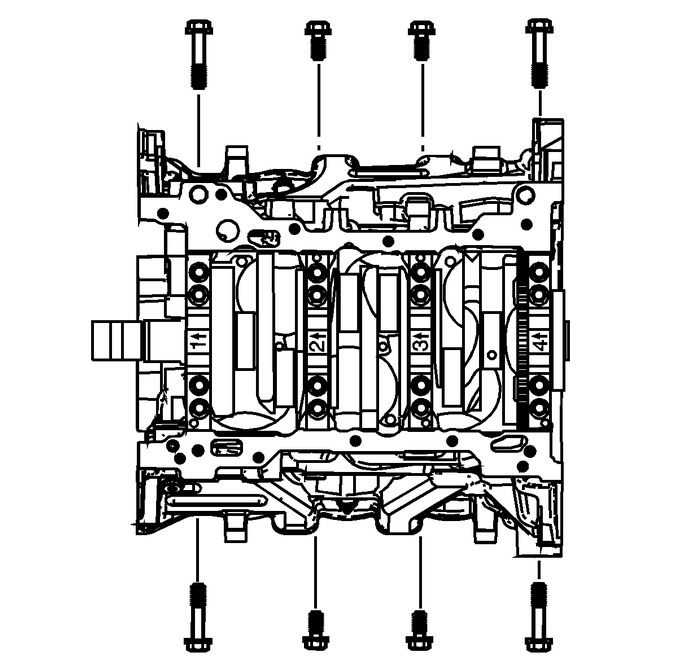 Compare your measurements with theEngine Mechanical Specifications. If the new bearings do not provide the proper crankshaft to bearing clearance, inspectthe following:Re-measure the crankshaft journals for the correct specified size and ensure the propernew bearings are being installed. 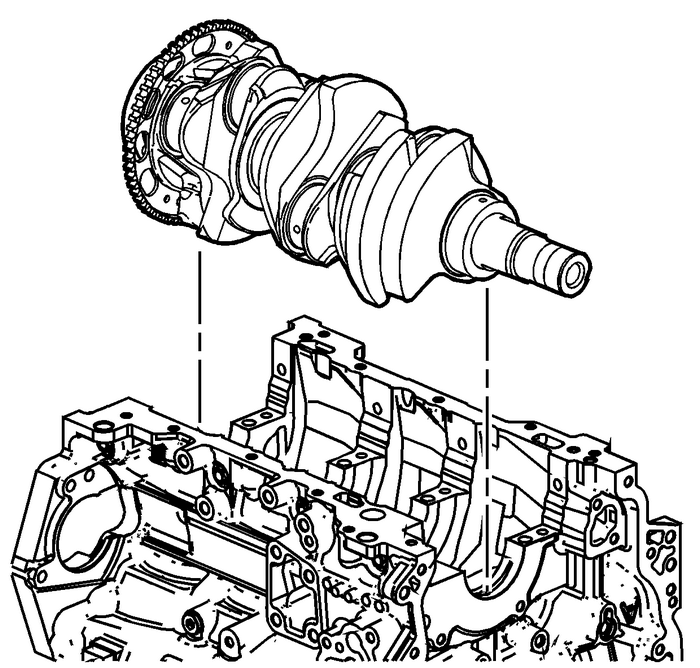 If the crankshaft journals are incorrectly sized,replace or regrind the crankshaft. Crankshaft machining is permitted and undersizedbearings are available.Re-measure the engine block crankshaft bearing bore diameter to ensure proper size.The engine block crankshaft bearing bore is not machinable and the block must be replacedif out of specification.Clean the plastic gaging material from the crankshaft bearing journals with a soft,lint-free cloth. 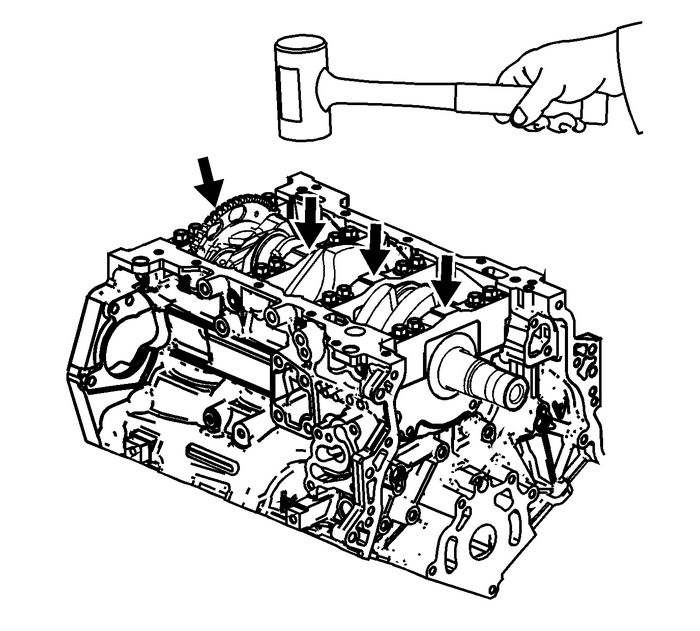 Lift the crankshaft out of the cylinder block. Apply a liberal amount of crankshaft prelube or clean engine oil to the upper andlower bearing surfaces. Refer toAdhesives, Fluids, Lubricants, and Sealersfor recommended lubricant. 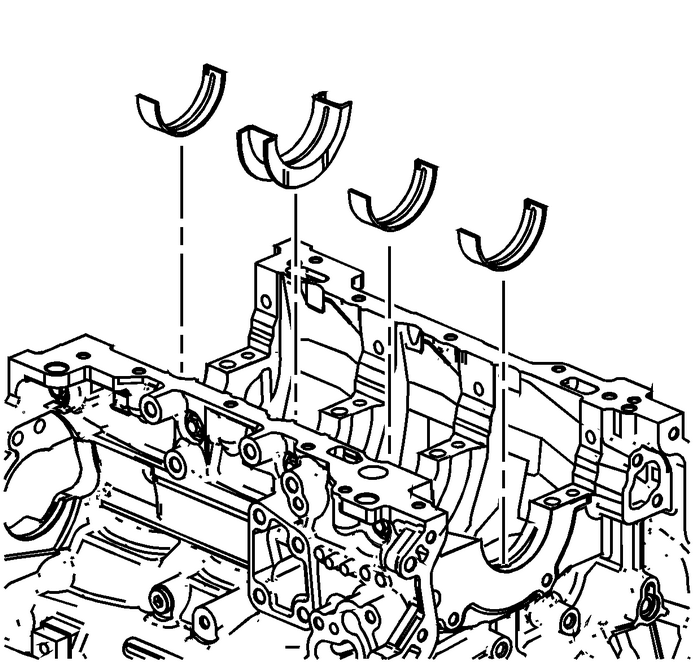 Gently lower the crankshaft into position in the cylinder block. Identify the proper order of the main bearing caps. The main bearing caps are numbered-1-(1)through-4, with the front main bearing cap marked with the number-1. The arrow-(2)is to be oriented to the front of the engine. Install the crankshaft main bearing caps. Loosely install the NEW inner main cap bolts.Loosely install the NEW outer main cap bolts. Loosely install the NEW short/inner side main cap bolts.Loosely install the NEW long/outer side main cap bolts. 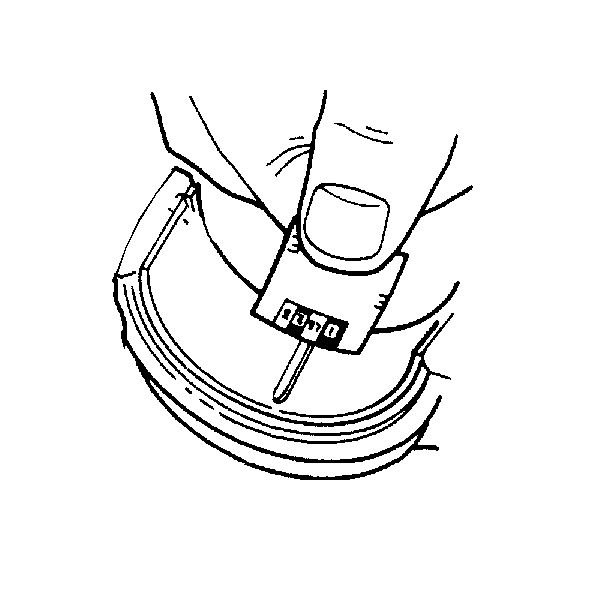 Tighten the main cap bolts using the EN 45059 meterin the following sequence:Tighten the inboard bolts-(1–8) first, in two passes.Tighten the inboard bolts to 20-Y (15-lb-ft) on the first pass.Tighten the inboard bolts-(1–8) an additional 80-degrees on the 2nd pass. Tighten the short/inner bolts-(17–20) third, in two passes.Tighten the short/inner bolts to 30-Y (22-lb-ft) on the first pass.Tighten the short/inner bolts-(17–20) an additional 60-degrees on the 2nd pass.Tighten the long/outer bolts-(21–24) fourth, in two passes.Tighten the long/outer bolts to 30-Y (22-lb-ft) on the first pass.Tighten the long/outer bolts-(21–24) an additional 60-degrees on the 2nd pass.Ensure that the crankshaft turns without binding or noise.